Let's redefine how we do business. Relationwise was founded in Denmark in 2001, the same year in which it won a national entrepreneurial prize for “best business plan and concept”. During the years we have followed The Golden Rule: Do unto others as you would expect them to do unto you. Let’s redefine how we do business. We tend to complicate our lives. Why not focus on what matters the most? Your customers and colleagues. It's all about people! There is only one boss, the customers, and they have the power to fire everybody. But you can't have happy customers without happy employees. Make your people your number one priority. We are not just talking - we can also walk the talk. 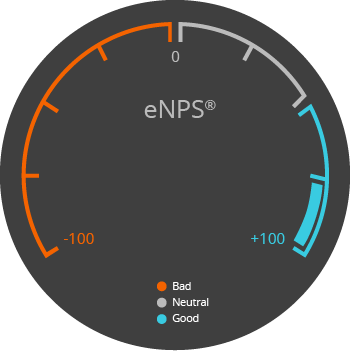 Check out our Net Promoter Score® in real time. Here's why we care - and why you should, too. Is your people really your number one priority? If not, it's time to wake up! If you don't have happy and engaged colleagues, they will simply turn their backs at you - and so will your customers. The next generation of business leaders put people first! Be part of a new and more fulfilling way of running your company. Let's break with the habits of how we do business. With a Net Promoter Score of 62, our customers love Relationwise. Should someone give us a low score, we follow up within 24 hours. We aren't satisfied until our customers give us a score of 9 or 10. We don't just sell software. We believe that we can all create better relations with our customers and colleagues. We want our books, campaigns and other initiatives to inspire you to create amazing relations for life..